Blogging To Cope With A Daughter's Cancer Fight Christina Avery describes herself as "someone who likes to keep private stuff private." But she found that blogging helped her deal with the stress of having a child with cancer, and it kept loved ones updated on her daughter's treatments. While Christina Avery is a private person, she has found some comfort in blogging about her daughter's struggle with cancer. Megan Avery after she took her final chemo pill. I met Christina Avery last year when her daughter, Megan, was two months shy of finishing a two-and-a-half-year leukemia treatment. 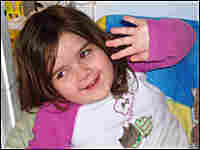 Megan was diagnosed with acute lymphoblastic leukemia on Nov. 2, 2006. The 3-year-old was categorized as a high-risk patient. "I was floored with the news," Avery says. "You never think someone is going to tell you your child has cancer." Soon after Megan's diagnosis, Avery and her husband, Ethan, set up a Web site to keep family and friends updated on Megan's progress. My first visit to the family's house in a Washington, D.C., suburb was on Dec. 2, 2008. Megan was 5 years old and attending a pre-kindergarten program. She was on chemotherapy pills, intravenous chemotherapy, antibiotics and steroids, among other medications. There were days then when she took as many as nine different pills. She looked and acted like a regular sweet 5-year-old — except that the steroids made her gain weight. And, if you looked closely at her hands, you could see warts all over her fingers — a reaction to some of the medications. I visited the Averys over the course of several months to explore why a mother who describes herself as "someone who likes to keep private stuff private" would open up her life on the Web during one of the most painful and private ordeals any family could go through. Granted, they set up a secure, nonsearchable site, and Ethan and Christina restricted access to those they chose. My grandmother died when I was 7 years old. She was sick for a long time, but I knew little of her condition then. I remember the long trips we made to see her and the hushed tones my mother would use to talk about Nana with her siblings on the phone. I remember seeing my mother cry when she thought she was alone in the room. And I never heard her talk about it in detail with anyone outside our family. I know my mother wasn't the exception. A lot of people go through a medical crisis in privacy. 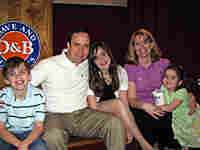 But today a growing number of people, like the Averys, are choosing to share their journey on the Web. Avery says that keeping the information flowing to family and friends was a challenge — particularly at the beginning, when they were trying to process the awful news while keeping loved ones updated on Megan's treatments. Her sister-in-law suggested using CaringBridge, an Internet service that helps keep loved ones in the loop during a medical crisis. The Web site quickly proved useful. "At the beginning, it was practicality, but then it quickly became a way for me to get emotions out," Avery says. "It's easier to tell people that kind of thing in writing than having to tell people on the phone — how bad you're feeling or how scary it is." She adds, "I like it because it's easy for people, too. They don't have to read it if they don't want to. It's not always fun to have to read about it." 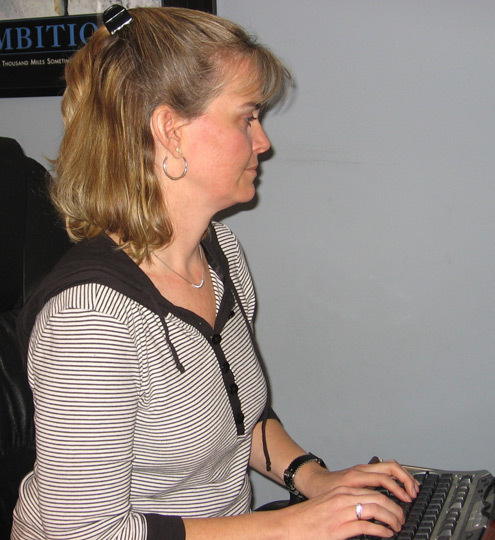 Christina never imagined she'd use the Web to write about her family life. But Ethan is thankful for his wife's devotion to the site. "This journal has proven to be therapeutic, a spiritual healer for Christina," he says. Christina Avery cherishes privacy, and he was worried about her, but "as she eased into the role of a journal writer, she really opened up with the written word." Even though Avery's entries tend to be positive and upbeat, she says she is not trying to sound like everything is fine in the journal. "I try to tell people the truth," she says. "But I guess I try to keep more of a positive spin." Her dad died in a car accident when she was 9 years old, and she knows "death can happen suddenly, and that event taught me to deal with tragedy," she says. Avery says she learned then the benefits of having a positive outlook. "If you put on a happy face enough days or months in a row, even if you're faking, eventually that becomes real," she says. I met Avery's mom and brother along the way. I was curious to hear their perspectives. Cathy Gustafson, her mom, says she follows the updates on the Web site religiously. "I figure, this way [Christina] doesn't have to be bombarded with calls," Gustafson says. But Avery's brother, Gerard Gustafson, says he's not one who would share his life on the Web. "I remember when she first sent the link for me to log in and I saw what it was — I was like, what is this? Why is she doing this? Why is she putting all this information out there?" he says. "She puts info out there whether we want to know it or not, but it's good for her, and that's what this is about," Gerard Gustafson says. He sometimes skips what he calls "mundane entries" — entries that carry no news about Megan's progress, but revolve more around the natural rhythms of Avery's family life. Christina Avery says she isn't worried about whether or not people read it; she won't know. And although it's nice to know people are reading, that's not where her motivation lies. Writing, she says, "keeps me sane." 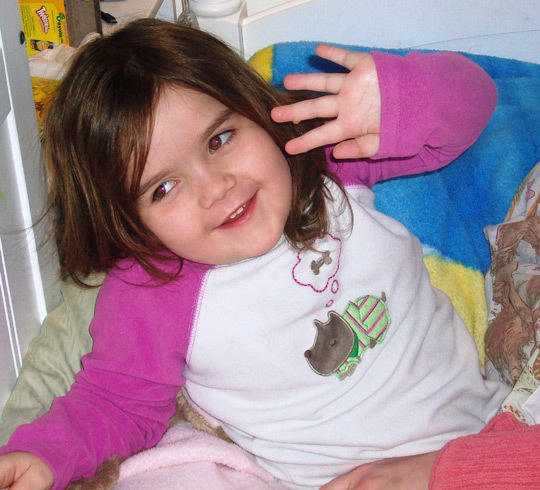 By Christmas last year, Megan was just a couple of months away from finishing treatment. The holidays marked a milestone of sorts: For the first time in two years, the family set up a live Christmas tree in their living room. These festive trees produce mold spores and can trigger allergies. Up until then, Megan's immune system was too vulnerable. But the real celebration came a couple of months later. 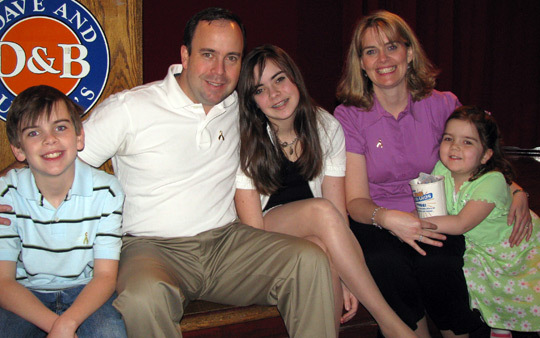 On Feb. 20, 2009, Megan took her last chemo pill before going to bed. The family gathered around Megan's bed and as she swallowed her last pill, Ethan, her dad, shouted, "Way to beat cancer, girl!" and her siblings Drew, 11, and Jessica, 14, and her mom cheered and clapped — a bittersweet moment marking the end of treatment. Yet Megan isn't cured. Ethan half jokes when he says his wife will "have withdrawal symptoms" when Megan is cured and she's forced to stop writing. But Christina plans to keep the Web site running. "Maybe I'll write less often as we move away from a life with cancer," she says. Over the next five years, Megan will undergo regular follow-up exams and monitoring. She's doing well without the medications, and this summer she's attending Camp Friendship, a camp for kids with cancer. And unlike me, who doesn't know much about my grandmother's disease, she will have a journal to turn to when she wants to know about her journey.